Thomas Cave was born 2 January 1781 in Melbury Osmond, Dorset. He was almost certainly the son of Thomas Cave of Melbury Osmond who appears in several Land Tax Returns of the 1790s (the only Cave in the area). He was recorded as a Freemason at Martock in 1817 and at a Princes Street lodge in 1819. 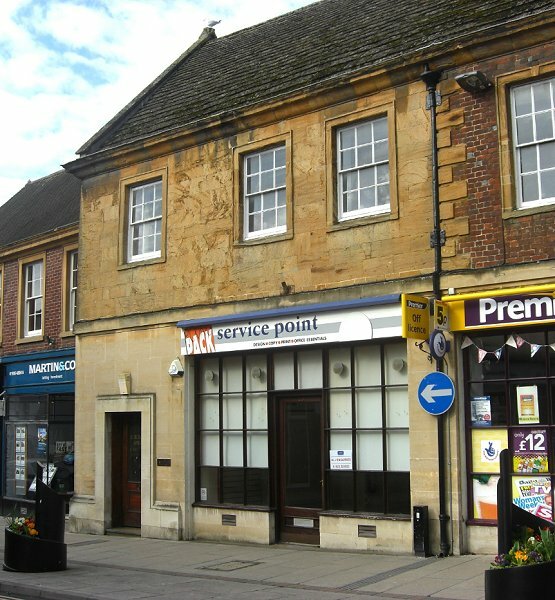 Indeed the first four meetings in Yeovil of the Lodge of Brotherly Love were held in his house. He was Worshipful Master of the Lodge in 1821, 1834, 1843 and again in 1851. 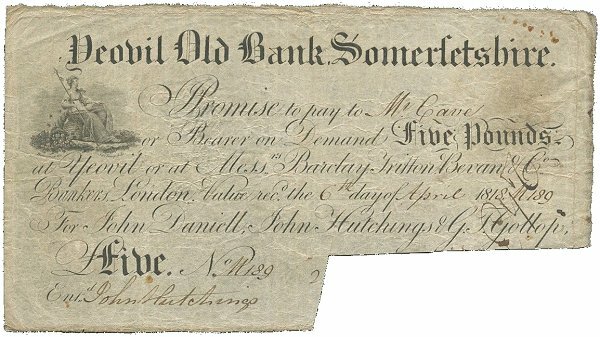 It seems likely that he was living in Yeovil by 1818 as evidenced by a £5 note issued by Yeovil Old Bank and payable to Thomas (illustrated below). On 31 August 1822 at Lopen, Thomas married Mary Adams Templeman (1792-1842), the daughter of Rev John Templeman and Sarah née Weare of Lopen. In 1824 Thomas established a brewery in Clarence Street (actually behind his house in Princes Street). What is rarely known, however, is that from a lease of 1825 in my collection Thomas Cave rented a malthouse adjoining today's 1 & 3 Princes Street referred to in the 1815 lease on that page (see also maps below). The company originally started life as Kitson & Cave which was listed in Pigot's Directory of 1824 but Thomas left the partnership in 1830 which was finally officially dissolved in December of that year. In fact by 1830 Pigot's Directory listed Thomas Cave as a 'Brewer & Maltster of Hendford' in his own right (This, in fact, although called Hendford was actually today's Princes Street and Cave's house was today's 23 & 25 Princes Street). He was successful early on and by 1828 at least had acquired the neighbouring property and he owned at least one public house, the White Hart (the later Duke of Clarence) in Stars Lane and was recorded in Land Tax Returns several times between 1828 and 1846. In 1834 Cave was listed as a subscriber to William Hull’s “History of the Glove Trade”. Thomas was a prominent member of Yeovil society; a member of the Vestry between 1827 and 1846 and served as Churchwarden in 1833 and 1834. He was a prominent Freemason and was a Town Commissioner from 1830 until 1849, liberally supporting the unsuccessful campaign to give Yeovil an elected municipal government. 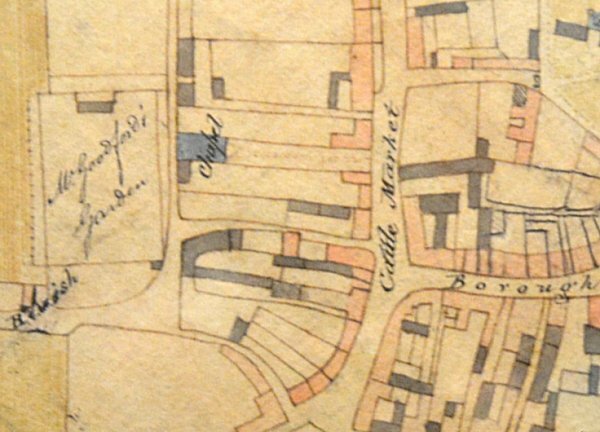 In the Somerset Gazette Directory of 1840 he was listed as 'Thomas Cave, Brewer, Maltster, Wine & Spirit Merchant, Cattle Market' - Cattle Market being an early nineteenth century name for Princes Street. In the 1841 census Thomas was listed as a brewer living in Hendford in the building known as John Old's House. At this time Hendford was the also the name of the western side of today's Princes Street as far as Park Road - it was all to do with ancient manor boundaries. needless to say Cave's premises didn't move, it was the street that had three different names during his lifetime. Mary died on 22 March 1842, aged 50, and a memorial to her is in Lopen church "In memory of Mary, wife of Mr Thomas Cave of Yeovil, and eldest daughter of the late Revd. J Templeman, MA of this place". On 23 July 1844 at Salisbury Cathedral Thomas married Mary Kaines (1799-1868) of Manston, Dorset, the daughter of Henry Kaines and Ann née Clark. By the time of the 1851 census Thomas, by now aged 61, described his occupation as a wine merchant and was still living in Hendford with Mary and two house servants. He was listed as 'Thomas Cave, Wine & Spirit Merchant, Brewer' in Pigot's Directory of 1842, Hunt & Co's Directory of 1850 and Slater's Directory of 1852-3. Then, in 1854, Thomas entered into a business partnership with Joseph Brutton, the company became known as Cave & Brutton. In the 1861 census Thomas described himself simply as a merchant and was still living in Hendford, by now actually called Princes Street, with Mary and two servants. Thomas Cave died, aged 76, on 10 September 1863 in Yeovil and Mary died on 17 September 1868 in Gillingham. Thomas Cave's signature against the Vestry minutes of 10 May 1832. E Watts' map of Yeovil of 1806. To put its location into context, today's 1 & 2 Princes Street is seen here at centre, to the immediate left of the "l" in "Cattle" (see enlargement below). Cattle Market is today's Princes Street, while Borough is today's High Street. The lane leading to Hewish Common Field, today's Huish, is at bottom left with Waterloo Lane leading down to centre bottom and what would later become Clarence Street running up to top left of centre, between Mr Goodford's garden and the Congregational Chapel. The very narrow lane that would become known as Porter's Lane, eventually widening to become today's Westminster Street runs left from Cattle Market. Of interest here - towards centre top, opposite Church Lane (today's Church Street) and to the left and above the "t" of "Market" is John Old's House, later to become Thomas Cave's house (today's 23 & 25 Princes Street), behind which Cave started his brewery in 1824. From a lease of 1825 it is known that Cave rented the malthouse shown on the map below. This enlargement of the previous map shows the site of today's 1 & 2 Princes Street which I have outlined in red. 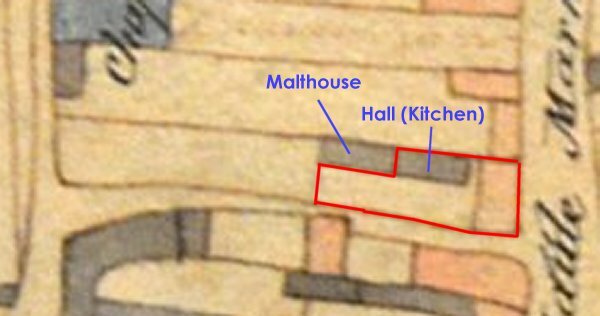 The house is shown in pink and the kitchen and malthouse are shaded grey. 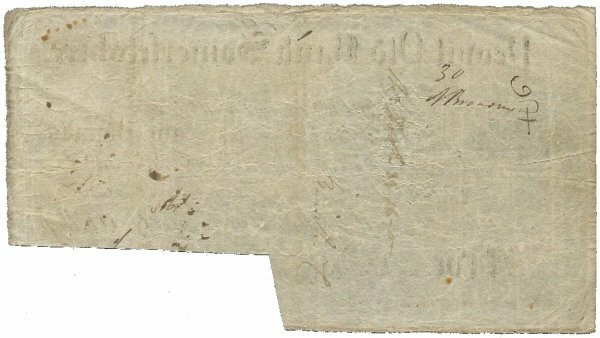 The obverse and reverse of a £5 note issued by Yeovil Old Bank in 1818. Signed by John Hutchings, it was payable to brewer Thomas Cave. A notice placed in the 5 April 1830 edition of the Western Flying Post noting the 'retirement' of Thomas Cave from the partnership. Thomas Cave's house in Princes Street, originally the house of John Old Snr and then John Old Jnr. Thomas Cave established his brewery at the rear of this property in 1824 which was later to become Brutton's Brewery.